A residential slide operator is perfect to use when space is limited so the gate runs parallel to the fence or wall. Additionally, a residential slide gate opener is perfect to use when the driveway is steep. Gate Openers Direct has been selling slide gate operators since 1999 at factory direct pricing. We are factory authorized distributor for the brands that we sell. We offer the top brands such as Doorking, Nice Apollo, FAAC, Viking, HySecurity, Liftmaster, Elite and more. Please take a look at our offerings. If you have any questions do not hesitate to contact us at 713-330-3333 or 877-688-GATE. You can also e-mail us any questions you may have. DoorKing 9024 Slide Gate Operator with battery backup. The 9024 can run exclusively on AC power but ..
Nice 7251 Slide Gate Opener, also commonly known as 72001K, is capable of handling gates up to 25 ft.. The Nice Apollo 7531 is a pad mounted operator for sliding gates up to 800 lbs weight and 25 ft of l.. The Doorking Model 9050 operator is designed to operate vehicular slide gates in residential applica.. 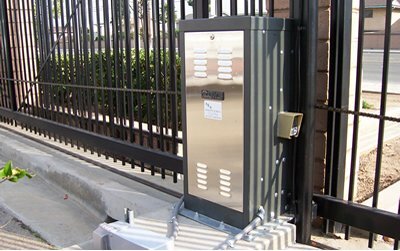 The DoorKing 9150 Slide Gate Operators are designed to operate vehicular slide gates in residential,..
HySecurity SLIDESMART DC 15 is an extremely reliable, continuous duty, commercial slide gate, electr..
HySecurity SLIDESMART DC 10F is an extremely reliable, continuous duty, commercial slide gate, elect.. This affordable gate opener features a low maintenance, direct drive 1/2 horsepower motor. Sim..
Ramset RAM1000 is ideal for heavy duty residential or commercial applications: ideal for cantilever .. This affordable Ramset residential slide gate opener features a direct-drive 1/2 horsepower mot..
OSCO SLC SERIES - Commercial duty slide gate operator series, available in 1/2 and 1 horsepower, 115.. Linear OSCO SLD Slide Gate OpenerLinear Osco SLD slide gate is a residential/commercial duty slide g.. The SLR is Linear Osco's residential duty slide gate operator series. They come standard with a cont.. Ideal for the installation requiring solar charging or full system operation during AC power outages..